Fundraiser by Jenna Powell : "Giving to Fly"
Through my son, Logan's, life journey, I have been privileged to attend and be a part of amazing limb loss camps, clinics and training. Together, he and I have only scratched the surface of all the wonderful programs in place for those with limb loss. There are so many amazing camps and clinics for Logan to explore and experience. I know others within the limb loss community also feel the same way, and to whom would greatly benefit from all that is available but cannot afford the opportunities. It was through my experience and research that I noticed a need, a missing piece to help make these special camps attainable to any and all who wanted to experience them… there was not a single organization devoted to providing grants for airfare to youth and adults affected by limb loss (and for their families) to be able to attend camps and clinics offered nationally. So what did I do? I took action and formed 'Giving to Fly', a 501c3 that provides grants to children, teenagers and adults (and a family member) whom have been affected by limb loss, with airline tickets to be able to attend camps, clinics and trainings which would otherwise be unavailable to them. These opportunities to participate in limb loss camps are valuable, they enrich the lives of those who attend and often times profoundly change the individual to the core. These camps physically, socially and emotionally provide so much to those affected by limb loss that I saw the need and formed Giving to Fly. 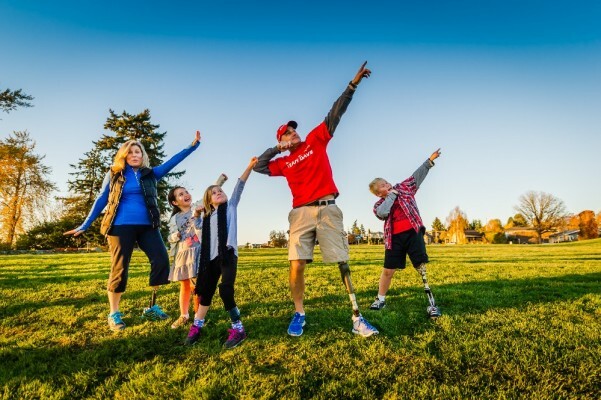 Donate to Giving to Fly and help grant the gift of flight to amputees and change a life forever. Thank you all for the unbelievable encouragement,support and generosity today. I cannot thank you all enough.I have added a new campaign goal as today we reached our original goal. 65flights in 1.5 years!! Super excited to be able to get more people to more events!!! With our upcoming softball fundraiser Aug. 9th, I want to thank all our supporters. We have been able to book flights for 14 people. To wrap up this year we have 4 more flights to book. Every single dollar goes back to families. I believe in my daughter's efforts to help others. The law firm of Floyd, Pflueger & Ringer donated at the request of Partner Colin Kearns. We have selected this charity as one of our showcased charities for 2018. I donated because Jenna was in my daughter Cathy’s first grade class and she showed me your story. Wonderful! I donated because I saw the story on Q13 news and it brought me to tears. Happy tears, for such a wonderful inspirational story! !